Turn Nonreaders into Successful Readers! The PCI Reading Program is a scientifically research-based curriculum created specifically to teach students with developmental disabilities, autism, and significant learning disabilities to read. Level One teaches 140 basic sight words from the Dolch and Fry lists and “real-world” words through a comprehensive system of repetition, “hands-on” practice, controlled-vocabulary reading, and high-interest activities. Students progress from reading individual words to 8-12 word sentences. Level One includes 28 books, ranging in length from 8 to 12 pages. By the end of Level One, nonreaders will have progressed to approximately a 1.0 reading level. PCI Reading Program Level One is designed as a one-on-one program and takes at least one full school year to complete. The five-step lesson cycle is based on visual discrimination and is designed to teach students to automatically recognize and correctly pronounce one word at a time. As each new word is learned, previous words are continually reviewed, which promotes both short- and long-term retention. Every word is practiced and reviewed over 100 times. For every five words learned, students are invited to read a full-color book about the everyday life of a contemporary adolescent character. Students must be able to follow simple, one-sentence directions. Students must be able to respond to a teacher request either verbally or by pointing. Students must be able to visually discriminate between words. 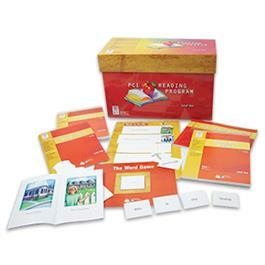 Level One of the PCI Reading Program teaches nonreaders to automatically recognize 140 sight words and common nouns and verbs through visual discrimination. Several sight word lists were used to compile the words, including the Dolch and Fry word lists. All Level One materials are carefully controlled to include only words students have learned, thereby promoting early reading success. Students read a book after every five words they learn, for a total of 28 books. The first part of the lesson cycle is the Word Building Lesson. These lessons begin by introducing a new word in isolation. They then provide scaffolded word-identification and reading exercises. A plastic reading viewer provided with the program is used to focus student attention on each line. Lines require students to either identify the new word from one or two distractors and then say the word, or read the new word in isolation. Additional lines review previously learned words in isolation and in controlled phrases and sentences. Key words are provided on both sides of the page to cue the instructor’s dialogue. Step 1A: Word Building Lesson: In Level One, students learn each word through visual discrimination. The Word Building Lessons serve as the foundation of this approach. Students identify, repeat, and read the new word and previously learned words. Once students have practiced identifying and reading the new word, they move to the Trace and Read Workbook for tactile reinforcement. Each word has its own practice page in the workbook. On the page, a student traces the newly learned word five times, saying the word while tracing it. Each word is also part of a controlled phrase or sentence constructed from previously learned words and/or pictures. Students read the new word in context, increasing their comprehension of the word’s meaning and usage. Step 1B: Trace and Read Workbook: In this step, students trace the new word and then read it in a phrase or sentence. Tracing the word helps cement it in a student’s mind, increasing recognition and recall. Reading the word in context helps reinforce its meaning. Each student has his or her own workbook to use throughout the program, which promotes a sense of accomplishment and encourages review of previously learned words. Having learned and traced the new word, students are now ready to further explore the word in the Guided Word Practice lesson. Teachers follow a scripted lesson plan that includes three scaffolded activities. First, under the guidance of an instructor, students use word and picture cards to construct phrases. Students build the phrases on a plastic card tray provided with the program and then read them. Words include the new word and previously learned words. Pictures show real-world objects that help students see how the new word is used in context. Following the card activity, students complete the read-aloud activity. This page, provided in the Guided Word Practice book, presents five phrases or sentences using the new word and previously learned words. In addition, full-color pictures enhance the reading where appropriate. After finishing the read-aloud, the instructor guides the student through the Real-World Connection, an oral-language activity that focuses on the word’s meaning and usage. In addition, every tenth lesson includes an activity called Match on the Mat, where students demonstrate comprehension of the most recently learned words by matching phrases and sentences to pictures. Step 1C: Guided Word Practice: In this step, students engage in hands-on reading practice with the new word and previously learned words. Working with an instructor, students build and read phrases and sentences using picture and word cards. For ease of use, all of the Guided Word Practice activities are scripted in one-page lesson plans. The instructor can be any adult trained to administer the program, including a teacher, paraeducator, classroom volunteer, or parent. Additional reading practice is provided in a student read-aloud. A real-world connection activity provides oral practice in using the word correctly based upon its most common meanings.The final hands-on activity occurs every tenth lesson and emphasizes comprehension. Students match pictures to phrases and sentences using the most recently learned words along with as many previously learned words as possible. By the end of the Guided Word Practice lesson, students have practiced reading or saying the new word in at least 15 phrases and sentences. Following Guided Word Practice, students practice identifying and reading the new word on the targeted activity sheets provided. The program includes two activity sheets for every word. Seven different types of activities are featured, allowing for variation in the activities for each word. Activities include both word identification and comprehension activities using the new word and previously learned words. Step 1D: Activity Sheets: This step promotes independent word identification practice and review through reproducible activity sheets. These activities can be completed in the classroom or sent home for reinforcement. Varied activities include basic visual-discrimination as well as comprehension exercises. Each of the Step 1 activities is repeated for four additional words. All four activities (Word Building Lesson, Trace and Read Workbook, Guided Word Practice, and Activity Sheets) are repeated for four additional words. By teaching words in groups of five, students are able to quickly see the connections between the words and gain a sense of accomplishment for each group of words learned. After learning five words, students review the words in an interactive activity called The Word Game. Word cards for the five words and up to 15 previously learned words are placed in the middle of the game board. Students take turns drawing a card and reading the word. If a player reads the word correctly, he or she keeps the card and play proceeds to the next player. If a word is read incorrectly, the facilitator models the word and has all of the players repeat the word. Then, the card is returned to the deck so that it can be drawn again. Step 3: The Word Game: This step provides a relaxed game atmosphere in which students can prepare for the posttest. It also allows more than one student to participate, encouraging peer interaction. The only prerequisite is that all of the players must have completed the lessons for the words to be reviewed. This helps guarantee a positive experience for all of the students. Posttests are provided after every five words taught to ensure mastery before moving forward in the program. Posttests include the five most recently learned words and up to 15 additional review words. The plastic viewer is used with the posttest to direct the student’s attention to the word. Key words are provided on both sides of the page to cue the instructor’s dialogue. Step 4: Posttest: Posttests allow the teacher to assess both short- and long-term retention of the newly learned words and previously learned words. Students are expected to score 100% on the posttest. Any word missed is to be reviewed and then reassessed. After mastering the posttest, students are ready to read a new book featuring the newly learned five words and any previously learned words. The books include full-color illustrations and focus on three different adolescent characters from a variety of settings. Characters include a Hispanic boy who lives in a big city, a Caucasian girl with Down syndrome who lives on a farm, and an African-American boy who lives in a small town. Students relate to these characters as they read the stories and learn about the characters’ everyday lives. In addition, lesson plans are provided in the Guided Word Practice books to foster and assess comprehension. Each lesson includes suggested pre-reading questions, a script to follow for introducing the book and guiding the student to read it, and suggested post-reading comprehension questions. Step 5: The Books: One of the motivational keys to the PCI Reading Program is the frequent availability of vocabulary-controlled books for students to read. A new book is available after every five words are mastered, for a total of 28 books in Level One. Because the books use only words students have learned, reading success is guaranteed. In addition, the books focus on real-world characters and situations, adding an important life-skills feature to the program. Scripted lesson plans for each book build comprehension skills by providing both pre- and post-reading questions. Lesson plans in this binder can be used to give students the foundational reading skills they will need to be successful readers. By focusing on five of the most basic pre-reading skills, the binder allows teachers to individualize instruction based on a student’s needs. Quotes from the research used to develop the units are provided throughout the lesson plans, and student objectives are provided for each lesson. To begin Level One of the Program, students need to be able to follow simple, one-sentence directions and demonstrate their understanding of a teacher’s request by either pointing or responding verbally. Students must also be able to see words on a page and somehow point to or otherwise indicate identification of those words. They need to be able to communicate a response to a question or directive. Students do not need to know the alphabet, although they must be able to visually discriminate between words and letters. For students who need additional practice in visual discrimination before beginning the program, teachers should use the lesson plans in Unit One of the Building Reading Skills binder. It is important to note that Level One of the PCI Reading Program is a systematic, whole-word approach to reading with a large amount of built-in repetition and review. This program is not intended for general education. It was developed for students with special needs who have not learned to read in traditional or multisensory phonics curriculums. In general, the students who begin Level One will be true nonreaders, regardless of age. At the start of the program, they may not be able to read or recognize a single word. One of the keys to the success of the PCI Reading Program is the thoughtful use of repetition and review to ensure both short- and long-term retention of the words taught. Many basal and other mainstream reading programs provide only 8 to 12 repetitions of a sight word or other vocabulary word to be learned. Quality intervention reading programs often provide 30 or more repetitions. But for students with developmental disabilities and significant learning differences, short- and long-term memory is often one of the problems that make it difficult to learn and retain skills. With these students in mind, the authors carefully constructed the activities to include over 100 practice and review opportunities for every word taught. Words are introduced and reviewed continually in every step of the program. This repetition is varied, involving every major learning modality, including visual, auditory, and tactile/kinesthetic. As a result, short- and long-term retention is virtually assured. When a student does demonstrate a lack of retention, teachers can remediate this immediately by having a student redo the appropriate Word Building or Guided Word Practice Lesson. The authors developed the PCI Reading Program with nonreaders of all ages in mind. All three levels of the program are supported by realistic illustrations of everyday objects and settings. The books provided in each leveled kit feature contemporary adolescent characters and age-appropriate story lines. Ultimately, the program is appropriate for students ages 5 to adult. While this program was specifically created for students with special needs, it is also appropriate for English-language learners who have a learning disability. It is important to note, however, that the high level of repetition and review in the program is not appropriate for some English-language learners. The PCI Reading Program is intended for use as a one-on-one program. All of the lessons and materials are structured for an adult facilitator to use with one student at the student’s own pace. This facilitator can be a teacher, paraeducator, parent, or any other adult working under the direction of a certified teacher. Scripts and cues are provided in the various lesson books to make the program easy to administer. In general, a facilitator can be trained to administer all of the elements of the program in one-half day or less. Because of the one-on-one nature of the program, students can complete the program at their own pace. As a result, it is not uncommon for a classroom using the PCI Reading Program to have every student at a different point in the curriculum, even if all of the students started the program on the same day. The PCI Reading Program is primarily print-based and includes a variety of lessons, manipulatives, and activity sheets. As an added bonus, the program provides the lessons in both print and software formats, allowing teachers to choose the best approach for each student. The software version of the Word Building Lessons also provides an excellent means of additional review Like the Word Building Lessons, the posttests are available in both print and software formats. The two formats can also be used together for additional practice and review. ORDER OUR OTHER MONEY-SAVING COMBOS!